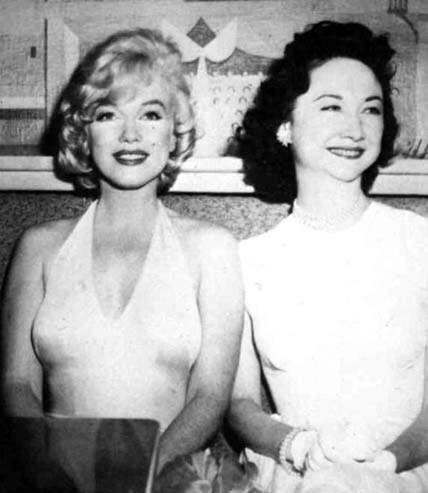 Did Dorothy Kilgallen, a well-known celebrity reporter, die because she knew who killed John F. Kennedy? This information was previously posted about four years ago...but I thought it needed to be rehashed. In early 2010, I received an email that referenced the JFK assassination and the conspiracy theories that have developed since. The email came from a person who I have corresponded with previously on paranormal related subjects. I 'sat' on the email, not knowing if I should post because of the gravity of the content. I decided to redact any reference to the writer and names of certain individuals as well as specific comments. In 1963, I was working as an agency supervisor for (REDACT) Life Insurance Co. of Dallas. I was in Dallas for a conference and, while there, stopped at a local magic shop (I worked my way through college as a magician and a hypnotist). I met and became friends with a lovely lady named (REDACT) who owned the shop. For a "chance" meeting, we became very close. She took me to a club in Dallas called the Carousel Club which was owned by a man named Jack Ruby. (REDACT reference to conversation at the club). Suffice it to say that Jack Ruby and (Lady) were very good friends. The next time I went back to Dallas, it was after Ruby had shot and killed Lee Harvey Oswald. (Lady) told me that the morning Ruby shot Oswald, she had received three "urgent" calls from unidentified people in Chicago desperately trying to reach Ruby. She was told to make every effort to contact Ruby and tell him that "The contract is canceled." No further details were given to her. Of course, Oswald was shot and killed before the "contract" could be canceled. (Lady) also told me that Ruby had been deeply involved with the underworld in Chicago who had given him the money to buy the Carousel Club. Now let's fast-forward a bit: My father was noted NY attorney, (REDACTED). If not the best-known lawyer in the country, (attorney) was certainly in the top two or three. Among his clients was an investigative newspaper columnist named Dorothy Kilgallen. She confided in (attorney) several times about stories she was about to break. The night before she died, she called (attorney) and told him she had "busted" the JFK assassination. She was going to New Orleans in the morning to confirm a couple of things, but she felt it was going to be the biggest story in American history. That night, without further explanation, she died of a massive heart attack (???). No autopsy. Neither event is conclusive of and by itself...but they certainly are elements to support a conspiracy theory. If you believe what the conspiracy books tell you, and know little else about the case, then the death of Dorothy Kilgallen, like many deaths of people tangentially connected to the case, seems "mysterious." 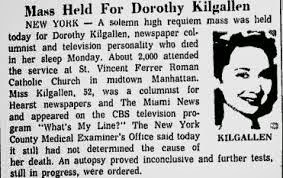 Kilgallen, a gossip columnist for the New York Journal-American and a panelist on the popular game show "What's My Line" was found dead in her New York City apartment on November 8, 1965. Whatever information Kilgallen learned and from whatever source, many researchers believe it brought about her strange death. She told attorney Mark Lane: "They've killed the President, [and] the government is not prepared to tell us the truth . . . " and that she planned to "break the case." To other friends she said: "This has to be a conspiracy! . . . I'm going to break the real story and have the biggest scoop of the century." And in her last column item regarding the assassination, published on September 3, 1965, Kilgallen wrote: "This story isn't going to die as long as there's a real reporter alove — and there are a lot of them." But on November 8, 1965, there was one less reporter. That day Dorothy Kilgallen was found dead in her home. It was initially reported that she died of a heart attack, but quickly this was changed to an overdose of alcohol and pills. How much of this is true, and how much of what's true is "mysterious?" Let's start with the story as reported in Kilgallen's own paper, the Journal-American. Dorothy Kilgallen, famed columnist of the Journal-American, died today at her home, 45 E. 68th St. She was 52. Miss Kilgallen died in her sleep. She was found by a maid and a hairdresser who came to the home to keep a 12:15 p.m. appointment. Alongside her bed was a book which she apparently had been reading before falling asleep. She had written her last column, which appears in today's editions, early in the morning and had sent it to The Journal-American offices by messenger at 2:30 am. Miss Kilgallen's husband, actor and producer Richard Kollmar, and their youngest child, Kerry, were sleeping in other rooms when she died. The article notes that Kilgallen's father said that Kilgallen "apparently suffered a heart attack." Marrs makes this out to be a sinister "story," but it clearly was the speculation of a grieving father who knew his daughter had been found dead with no evidence of foul play. As many personalities whose multiple duties and responsibilities demand unceasing attention, Miss Kilgallen experienced recurring tensions in meeting her deadlines for performances — both as a newspaperwoman and TV performer. The details of Kilgallen's death are recorded in documents produced by the office of the Medical Examiner. These are National Archives Record Number 180-10071-10433 — Agency File number 007250 from the House Select Committee on Assassinations. This set of documents includes the "Report of Death" form from the Office of Chief Medical Examiner, the "Autopsy Report" (with the autopsy being performed by Junior Medical Examiner James Luke with doctors Sturner and Baden present), a handwritten addendum to the "Autopsy Report" that gave the microscopic and chemical findings, and "Notice of Death" of the Office of Chief Medical Examiner of the City of New York. 1. Her husband was with her in her New York east side apartment, although not in the same bedroom. 2. Her husband said she returned from "What's My Line" feeling chipper. She went to her bedroom. The next day he found her dead. 3. The examination of the body at the scene found "no trauma" and "no signs violence" [sic]. 4. The autopsy found no injuries whatsoever that could account for her death, nor any evidence of a struggle nor (say) pills being forced down her throat. 5. The cause of death in the autopsy says "PENDING FURTHER STUDY." A handwritten note below that says "Acute ethanol and barbiturate intoxication. Circumstances undetermined." This handwritten note was apparently based on the chemical findings, which were appended to the report. She had a blood alcohol level of 0.15, and barbiturate level that says "UV - 2.4 [illegible]" in the liver. Conclusion? It's really impossible to believe some Oliver Stone scenario of hoods coming into her apartment and forcing a bunch of pills down her throat. Neither the alcohol nor the barbiturate level was absurdly high, as it would be with an intentional overdose. I suppose it's possible she committed suicide by mixing both alcohol and barbiturates intentionally, but this really looks like an accident. 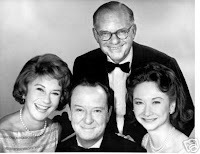 A member for years of the panel on the nationwide CBS TV show "What's My Line," Miss Kilgallen appeared with the panel last night. She was at her usual best, asking probing questions and guessing the occupation of two of the five persons who appeared on the show. "She was in excellent spirits and, as usual, right on the ball," said John Daly, moderator of the show. Of course, the Journal-American would have a vested interest in presenting their columnist in the best light. But it's also true that the "Report of Death" quoted her husband saying she was "chipper" after appearing on "What's My Line." Interestingly, she was working on a book to be titled Murder One. 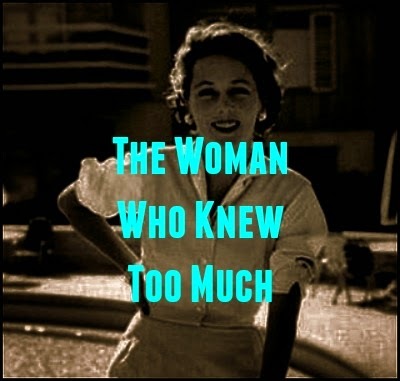 It was to be a compilation and study of all the trials she had covered — including the Sam Sheppard trial, the Wayne Lonegan trial, the Dr. Bernard Finch trial, as well as the trial of Bruno Hauptman. There is no mention in the article that the book would include the Jack Ruby trial, although it's very logical to assume it would have done so, since she had covered it and it was even more celebrated than the others (Journal-American, Nov. 8, 1965). In fact, in the November 15, 1965 article, it is claimed that she was particularly happy that she had completed the preface to her book and submitted it to Bennet Cerf, fellow panelist on "What's My Line" and "a book publisher." Still, if she had "broken open" the JFK assassination case, it's very hard to see why she would have relegated her earth-shaking information to a chapter in a book that covered a half-dozen or so murder cases, rather than writing a book on the assassination, or using her column to reveal the nature of the plot. In fact, she had written numerous columns on the assassination. None of the columns, however, contained any earth shaking information. Rather, they just repeated conspiracy factoids that had been, or soon would be, all over the JFK assassination literature. Her claim that she was going to "break the case" appears to be nothing beyond professional bravado. She never claimed to "have broken" the case, or said "I know who the conspirators were." Whatever her high hopes, there is no evidence that she had any information dangerous to any conspiracy, nor that she would have been able to do what no reporter has done since. Variety - from 10/2008 - Producer John Davis has optioned "Good Night, Dorothy Kilgallen," a proposal for an expose book by Paul Alexander that ties the syndicated columnist’s death to her investigation of the JFK assassination. Book sold to St. Martin's Press. Davis will produce through his Davis Entertainment banner and will bring the project to Fox through his first-look deal. Alexander, whose previous books include "Boulevard of Broken Dreams: The Life of James Dean," will script a fictionalized conspiracy film supervised by screenwriter Shane Salerno. Salerno and Derek Dauchy will be exec producers. In her syndicated column Kilgallencovered subjects ranging from Hollywood to Sam Sheppard’s murder trial. After the death of President John F. Kennedy, whom she considered a friend, Kilgallen became obsessed with proving a conspiracy and landed the only interview with Jack Ruby, the killer of assassin Lee Harvey Oswald, for a book called "Murder One." Alexander’s tome asserts that Kilgallen died mysteriously after turning in her book, with the chapters about JFK disappearing. "The striking thing about Paul’s book proposal was that Dorothy wasn’t reporting on the death of a president as much as she was investigating the murder of a friend," Salerno said. Salerno recently set up the spec "Reckless" with Davis and Fox and preemptively sold Fox his spec "The Doomsday Protocol." official party line that Oswald worked alone? How many people died highly unusual deaths that were connected with the assassination? What was LBJ's involvement in this? He sure didn't seem concerned or surprised. Kennedy said right before he died that we were all betrayed at the Bay of Pigs and he vowed to find those responsible. If enough people were that fearless things would be VERY different.